British scientist Sir Tim Berners-Lee invented the World Wide Web just over 20 years ago. Even the boldest forecaster could not have imagined its explosive growth. As a global information system it has utterly changed the world. However, a severe downside is the challenge to data security and personal privacy. The internet is now overrun with cyber attacks and hackers. Internet security has become a very serious and common concern for the entire world. Recently the American company Mandiant published a report on cyber security. This report accuses China of being the origin of most cyber attacks and portrays China as an arch-hacker. This report immediately attracted wide media attention. Many have joined the chorus of criticising China. Mandiant is an American cyber security firm founded in 2004. It has grown very fast selling its services for commercial gain. Doubtless this report will accelerate its growth due to the enormous free publicity it has attracted. People have reason to be suspicious of the ulterior motive of Mandiant when it was targeting a Chinese military facility. Any person with common sense knows that no country will ever declare the purposes of its military facilities nor allow access for foreign investigation. And this leaves the public no other choice but listen to Mandiant’s story. But facts speak louder than words. I want to assure the British public that Chinese law prohibits hacking and other activities compromising internet security. The Chinese government has been resolutely fighting cyber-related crimes. The Chinese military has never supported any hacking activities. However, in the extensive media coverage on the Mandiant report there was little mention of the commitment of the Chinese government to tackle the global scourge of cyber attacks that affects us all. Cyber attacks by nature are transnational, anonymous and deceptive. It is extremely difficult to ascertain the source of any attack. Cyber attacks launched from stolen or faked IP addresses take place around the world on daily basis. Some impartial Western media and professionals have already raised doubts about the report. In their view the so-called evidence of Mandiant does not suffice to locate the attacks to a specific building, still less to argue that the attacks have been organised by the Chinese military. They believe that the Mandiant report suffers a “blame China first” bias. China is a serious victim of cyber attacks. It is because China is fully aware of the complexity of the cyber environment that China never makes accusations against any other country. The 2011 statistics from China’s National Computer Emergency Response Technical Team (CNCERT) show 47,000 overseas IPs originating from the United States, Japan, Republic of Korea and other foreign countries were used as Trojans and zombies designed to control host computers in China. More than 8 million host IPs in China were embedded with Trojans and zombies. Most of the intrusions showed themselves as originating from the United States. However China has been very cautious not to attribute them to any foreign government agency or individual. The Chinese government is committed to international cooperation against cyber crime. We have conducted bilateral cyber-related law enforcement cooperation with Britain, USA, Germany and Russia. We have also signed with many countries bilateral agreements on cyber-related judicial cooperation. In 2011 CNCERT collaborated with foreign security agencies in dealing with 1033 cyber security incidents in China and 568 cross-border cases. These cases included attacks against foreign financial and government agencies, such as the Royal Bank of Scotland, Deutsche Postbank and a Korean government website. In September 2011 China and Russia jointly submitted to the United Nations a draft International Code of Conduct for Information Security. China is deeply sincere in seeking cooperation to tackle cyber crime. This common threat needs the participation of the whole international community. The reason is simple. A global problem needs a global solution. 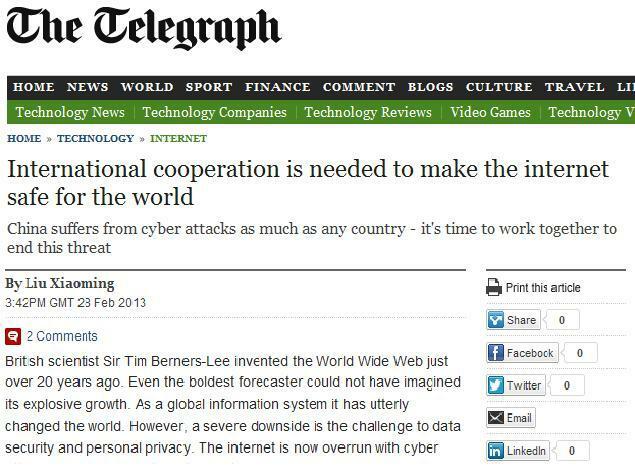 I make an appeal: stop unproven accusations and let us work together for a safe cyber space.